Last week, I shared a list of Spanish reading apps. This week, I'm focusing on a new math app from PBS KIDS. 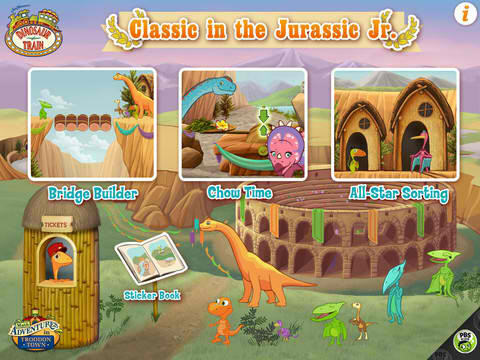 Name: Dinosaur Train Classic in the Jurassic, Jr.! 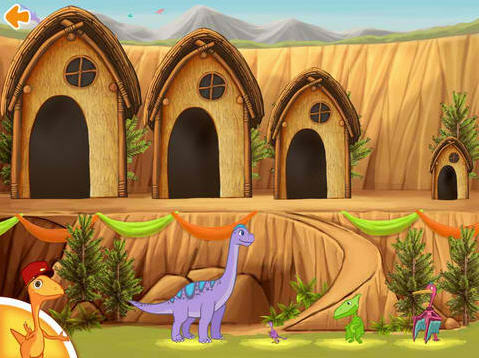 Brief Description: Kids play through 3 math-based games focused on sorting, balance, and counting to help Gilbert get Troodon Town ready for a big event. My son likes anything having to do with dinosaurs, and is a Dinosaur Train fan. So he enjoys the subject matter and the fact that he recognizes many of the characters. But he also likes the challenges of the different activities even though he is already in 1st grade. 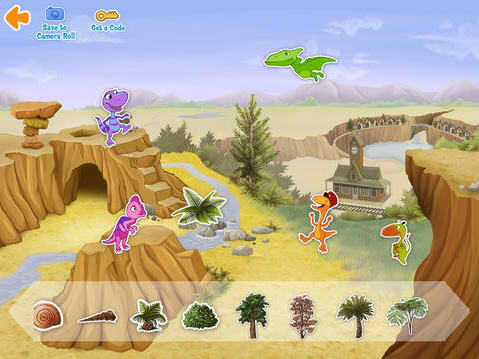 He also likes the sticker book activity that is just for fun and allows him to drag and drop images of dinosaurs, trees, rocks, and plants to different spots on the screen creating his own little picture. This app has three different activities that develop math skills like measuring, adding, sorting, and how to use a balance. 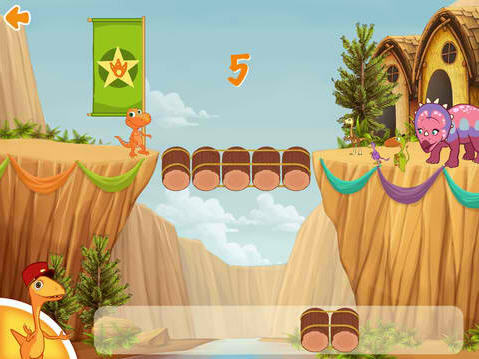 In the Bridge Builder section, your child has to measure the distance across a chasm, then drag the right number of logs across to make a bridge for the dinosaur to cross. 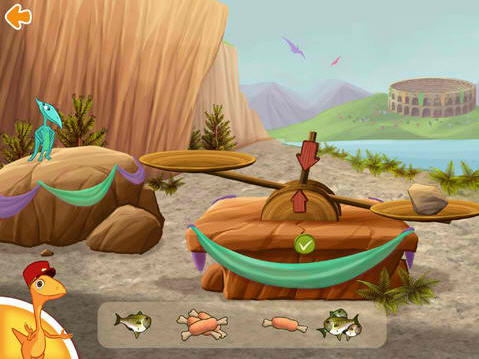 In Chow Time, the player must learn how to use a balance scale by selecting the right amount of food for a dinosaur to eat. The food's weight must equal that of a small (or big!) stone placed on one end of the balance. And finally, in All-Star Sorting, the player must put the dinosaurs in order from shortest to tallest and then help them get home by dragging them to the correct sized doorway. This app is currently only available in English. What a great app. I know my friend's girls and my godson would love this. It's a fun way to learn math! I like that you mentioned both what your son likes and what you like about the app. I often see app reviews for children that are written only from the parent's perspective, so it's valuable to know what your son thought. This app sounds great because it sort of disguises the math as a fun game but they're learning math at the same time without maybe really realizing it. I know a few parents who will definitely appreciate this app, so thanks for the review. I'll pass on the link! This looks really cool. Little Man loves Dinosaur Train so I will definitely be checking this out since school is around the corner. So cute! My son is getting into math a lot, I'm sure he'll love it! Fun! My eldest loves games that involve sorting or measuring and doesn't even realize how much she is learning. Perfect! My kids love dinosaurs too! Thanks for the review. This looks like so much fun! My son is going to love it! It's always good to know about new apps! My kids love them, even my 2-year-old and I love the educational ones. Thanks for sharing with us! I love PBS Kids' apps!